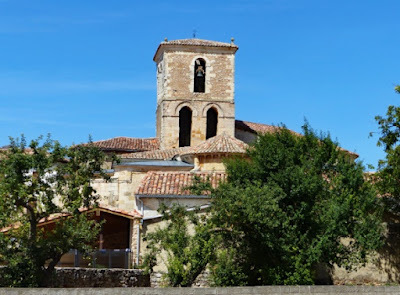 The church of Nuestra Señora de la Asunción is situated within the village of Perazancas de Ojeda which is 13 kilometres due west of Aguilar de Campóo ‘as the crow flies’. It can be reached from Aguilar by driving west for 15 kilometres on the PP-2135 in the direction of Vallespinosa de Aguilar and Cozuelos de Ojeda and then taking the P-227 north for 4 kilometres. 1. The church as seen from the east. The church has a nave and two aisles. The original Romanesque church had one nave with two bays, a straight presbytery and a round apse and two lateral chapels; the apse was built over rock. The church was extended by adding two aisles in the 13th century. Then, in the 17th century, the church was extended to the north and west, changing its orientation from east/west to north/south, with the square apse in the north as it is today. The sacristy, atrium, and belfry date from 18th century. The church is surrounded by a 17th century wall. The original Romanesque apse in the east, now a chapel acting as a baptistery, is divided into three sections by two engaged columns. It was reinforced by two buttresses at a later date. It has a splayed window surrounded by a dripstone decorated with intertwined vines and an archivolt decorated with curled ferns resting on two capitals with acanthus leaves. Immediately below the window is a billet impost. 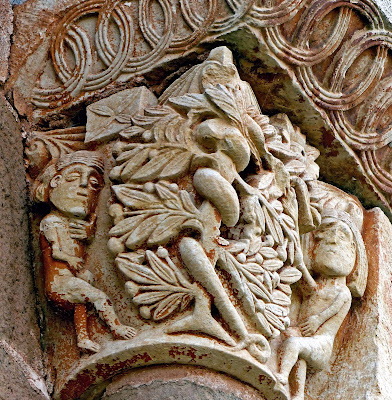 The arched doorway (photo 2) is surmounted by a dripstone decorated with undulating stems and leaves with, on the right side, a basilisk (symbol of Satan) chasing a harpy entwined by foliage. Below are two archivolts resting on a continuous impost, decorated with palmettes, and on capitals and columns. Both outer capitals have two rows of acanthus leaves. 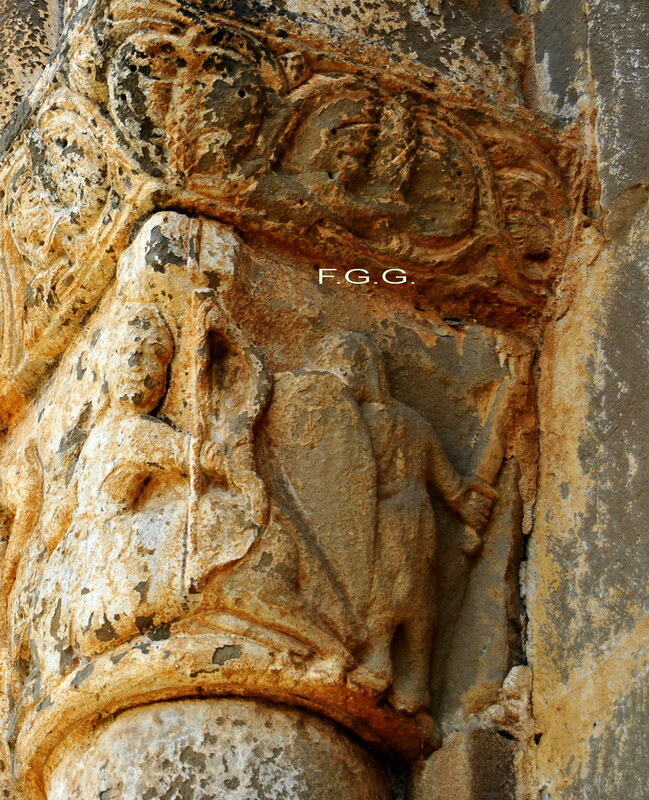 The inner left capital depicts the Flight into Egypt with acanthus leaves in the background. Mary sits with Jesus on a donkey at the right while, on the left, Joseph holds the animal’s reins. The right side of the left impost has birds amongst foliage, pecking at seed. 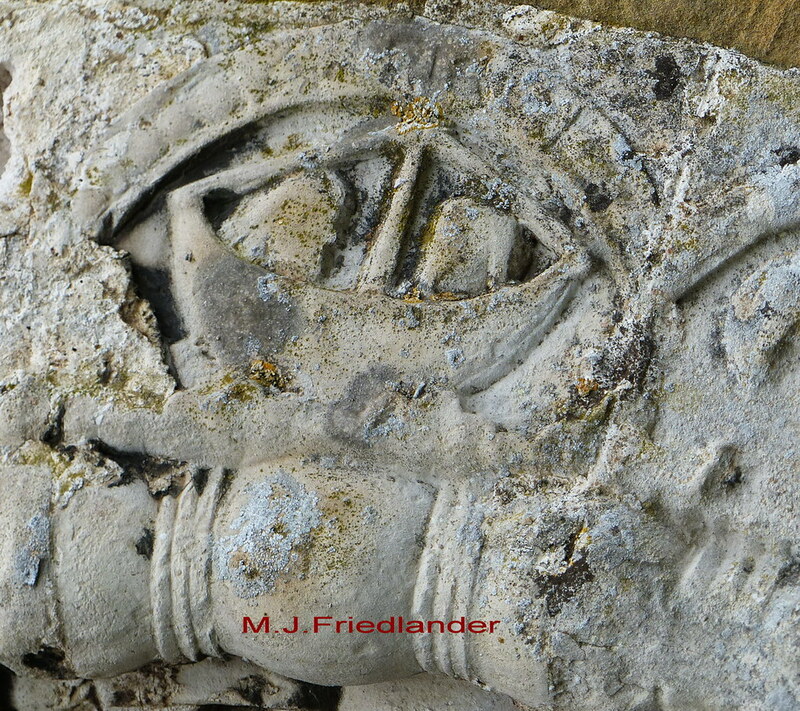 The inner right capital has a mounted knight, much damaged, wearing a coat of mail and holding a large pointed shield. His horse is being attacked by two basilisks, one from the front and one from the rear. 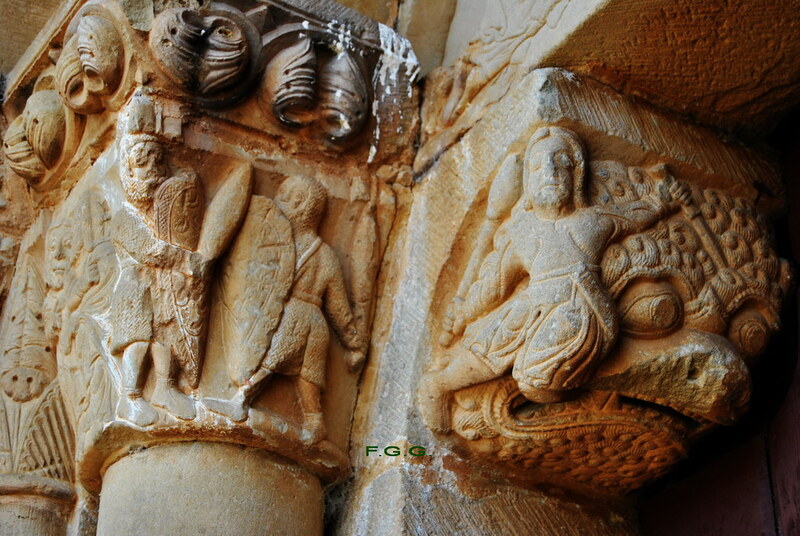 Knights fighting mythical monsters are often depicted at the entrance to a church to remind the faithful of the constant need to overcome evil. And, in Spain where the Reconquista was taking place, a feudal knight was a symbol of the defending order against any enemy. 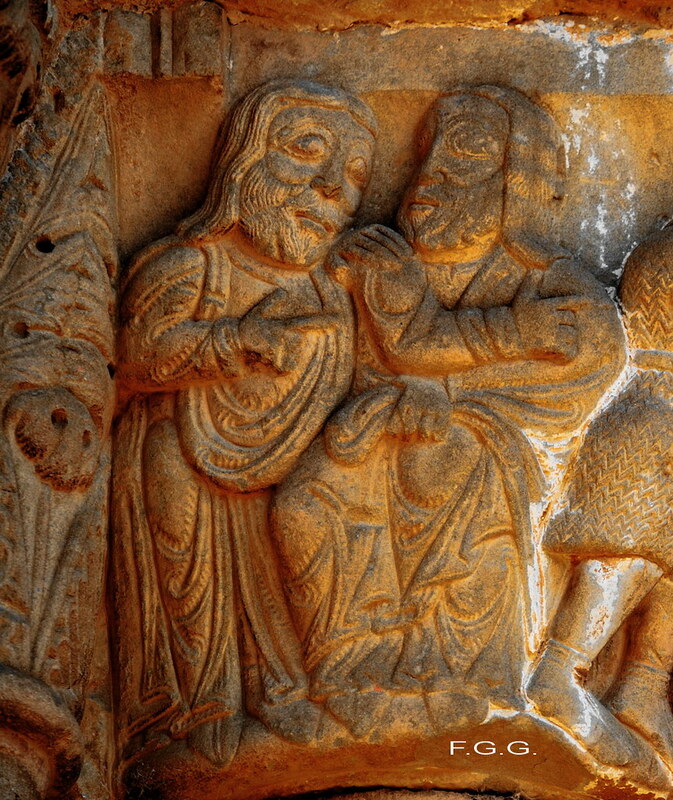 The interior archivolt has radially placed figures that are almost three-dimensional. 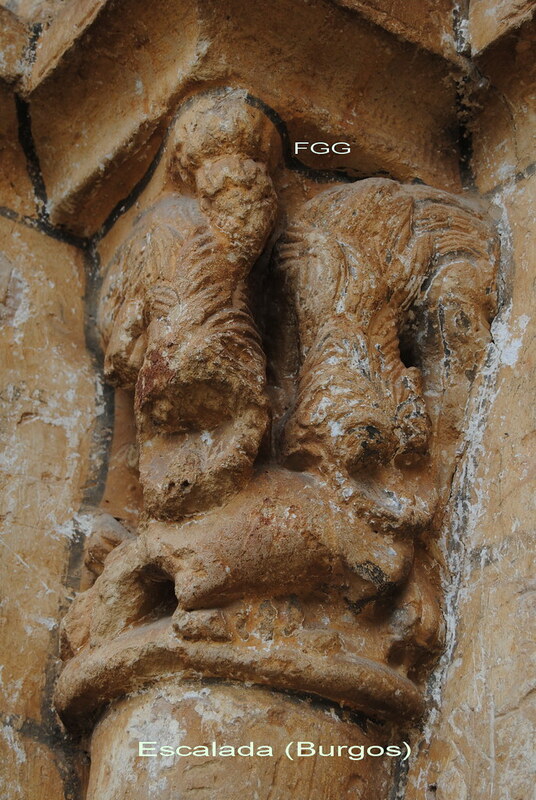 They most likely represent events that used to take place in front of church entrances in the Middle Ages. This entrance represents a silent witness to those events. The depictions on the inner archivolt, from left to right, most likely represent the following two events that used to take place in front of church (interpretation I owe to the article, Piasca: el rastro de un beso – see Bibliography). 1. 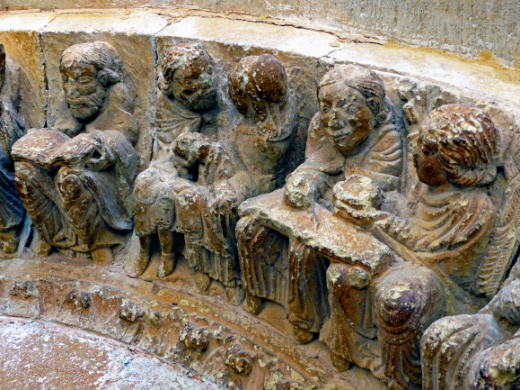 A ‘Trial by Ordeal’ (ordalias) in which God would grant success to the righteous (photo 3). This trial usually took place to defend someone’s honour. In this case, it would seem to be the honour of the lady (third from the left) who has her hands raised to her cheeks in desperation. The trial is depicted by a fight between two men (first and second from the left) who hold shields and truncheons. They are not fighting to the death – there are no swords involved and they are only holding wicker shields, one of which has a cross at its centre, and wooden clubs. 3. Trial by ordeal – two men fighting to defend the honour of the lady on the right. 2. A Wedding. Important weddings were often celebrated by musicians and a circus of acrobats and tamed animals. Here a few musicians are represented: a man playing the rebec (rabel), a man playing the zither (salterio), and a harpist. Between the rebec player and the zither player there is a monkey. After the musicians, there is a tonsured monk reading a religious book, most likely the wedding ritual. He is followed by the loving bridal couple and then another tonsured monk who is busy writing the marriage contract in a book. Next to him is an angel holding the monk’s inkpot in one hand and blessing the contract with his other – notice the position of his two fingers (photo 4). 4. Wedding - monk reading ritual, bridal couple, monk writing contract, angel holding ink pot. The bridal couple sit side by side. She is lady of high status as shown by her clothing: she wears a diadem over her bonnet and a sheer diaphanous veil covers her hair. She caresses the man’s cheek with her right hand and he caresses hers with his left. They hold a bundle in front of them which is most likely the arras, the thirteen coins given at a wedding by the groom to the bride as a token of confirmation of the marriage vows, a Spanish custom to this day. Lastly, there is a female acrobat with her body bent over backwards, supporting herself by having her legs bent beneath and behind her and by her arms held above and behind her shoulders. In Spain weddings took place in front of the church door until the early twentieth century. Once officially married the couple would go inside the church to be blessed. A stole was placed across the shoulders of the groom and over the head of the bride. This custom prevailed till the 1970s. Musicians accompanied by monkeys and acrobats often performed at village feasts and at religious ceremonies which, even though they were not approved of by the Church, they were welcomed by the villagers as a relief from their daily tasks. Consequently, they became an integral part of the festivities. 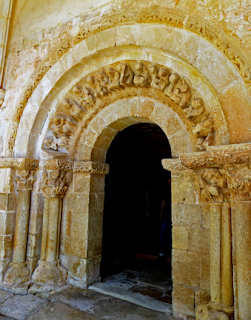 The original Romanesque apse has, in its lower part, a blind arcade of five tri-lobed arches resting on twin columns and capitals. 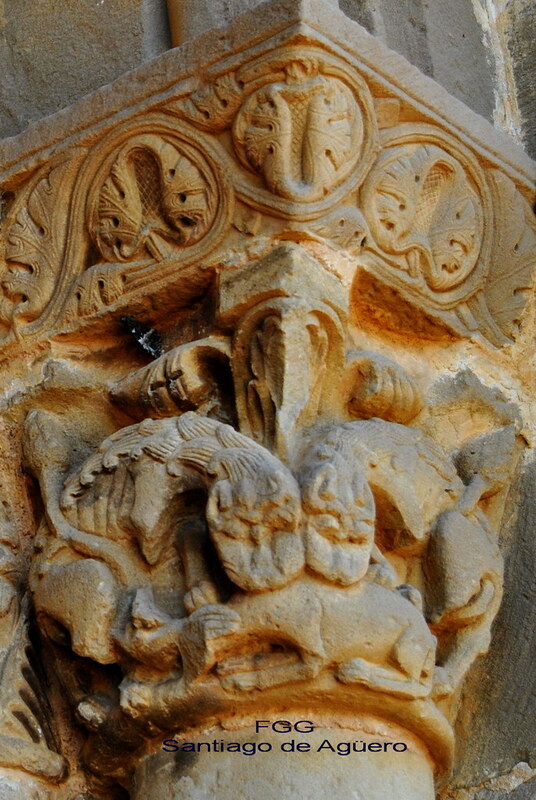 The capitals are decorated with acanthus leaves with volutes in the upper corners. They are surrounded by a dripstone decorated with leaves and masks on the spandrels. A Romanesque conical-shaped font is kept in this chapel. The village of Barrio de Santa Maria is on the west side of the Embalse de Aguilar. It can be reached by driving west out of Aguilar de Campoó on the PP 2131 for 6.5 kilometres to the junction with the PP 2132. Turn right on to the PP 2132 in the direction of Salinas de Pisuerga. Barrio de Santa Maria is 5.5 kilometres north on the PP 2132. The Ermita de Santa Eulalia is some 400 metres southwest of the village on the Calle Iglesia. Its GPS coordinates are: 42°48'37.33"N, 4°22'31.58"W and it is at an altitude of 970 metres. The hermitage used to be the church of the mediaeval hamlet of Santa Olalla which no longer exists. The hermitage entrance is on the north side because the hamlet it served as a church was situated on that side and thus this was the most accessible entrance for the parishioners. On stylistic grounds, it is dated towards the end of the 12th century or beginning of the 13th. It has a single nave with no later addition to the structure making it one of the best-preserved churches in the province of Palencia. 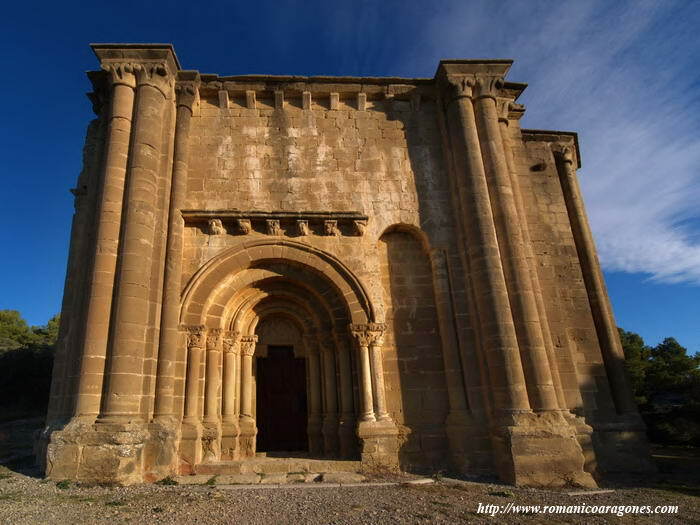 It also has a remarkable painted interior dating from 1300, the restoration of which was executed by the Centro de Estudios del Romanico of Aguilar de Campóo and finished at the end of 1996. Externally, the north and south walls of this single nave church are contained between two buttresses on the east and west sides. The church has a slightly projecting north entrance, followed by a lower straight presbytery and round apse. The roof throughout the church is supported by an undecorated corbel table. The west wall extends to form a bell-cote topped by a segmented pediment. 1. The church's east elevation showing its position on the slope. Cars are left below. The door is surrounded by four archivolts with roll and concave moulding. They rest on a continuous impost which extends right around the projecting entrance. It is decorated with an undulating stem with palmettes which emanates from an animal’s mouth. The left impost is much damaged. On each side, there are four capitals on columns, two of the columns being monolithic and two segmented. The left capitals are decorated with a row of stylised leaves; the right capitals have more elaborate leaves. The attractive door is original and intricate wrought iron keeps the wooden sections in place (photo 2). It is considerably weathered and over time has split in various places. Wrought iron clamps were used during restoration in the 1980s to prevent any further splitting. They are V-shaped to differentiate them from the original wrought iron decoration. 2. North door – intricate wrought iron keeps the wooden section in place. The apse is divided vertically in three sections by three engaged segmented columns which rest on bases and podiums of different heights to compensate for the slope of the ground. Each section has a loophole window surrounded by a roll and convex archivolt with a fillet separating it from a dripstone. Two imposts surround the apse – one with a billet below the windows and another which serves as the abacus to the capitals. North Window: It has acanthus leaves on the left capital. On the right capital Adam and Eve stand on either side of a leafy tree with the serpent around its trunk (photo 3). 3. Apse north window, right capital – Adam and Eve and the serpent. The left impost has crosses with four leaves and a bud at its centre. There is a serpent on its inner side. The right impost has striated interlocked roundels. Central Window: It has a dripstone divided in four parts by a central cross and decorated with balls. It has a tympanum, edged with a blind arcade and surrounded by a billet, portraying a bearded angel in the act of blessing and wearing the stole and maniple of a priest. The right impost has ribbed roundels with open buds at their centres; a striated ribbon lashes them together. The left impost is decorated with pairs of striated curls. Both capitals have stylised leaves. South window: The impost on both sides is decorated with beaded undulating stems with palmettes, the left stem emanating from an animal’s mouth. 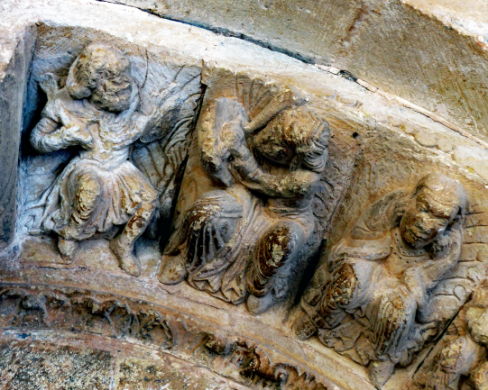 The left capital has a pair of confronted harpies – a male on the left and a female on the right – wearing Phrygian caps symbolising their magical powers and their eastern provenance. The right capital has a griffon (the body and hindquarters of a horse and the wings and head of an eagle) attacking a lion. The single nave is barrel-vaulted with three projecting transverse arches. A double triumphal arch gives way to a straight presbytery and a round apse with three loophole windows which are surrounded by an archivolt. The apse has three imposts: the first at the lower part of the window, the second acting as an abacus to the columns and the third, which goes all around the church, being at the join of the dome and the wall. The entire apse and walls were covered by frescoes dating from the 1300s; they are much damaged. The dome of the apse has Christ in Majesty with, below him on the right, the bull of Luke and, on the left, the lion of Mark, both identified by an inscription. The rest of the apse is covered with squares in a chessboard-like manner with crosses in some of them. On the presbytery walls, which are divided into two registers, the outlines of the figures are clearly visible. The south presbytery wall has frescoes of the suffering of the condemned after the Last Judgement (photo 4). In the top register, on the right, some devils are stoking a fire below a large cauldron while, on the left, two demons hold some souls in human form. In the lower register, on the right, there is the gaping mouth of Leviathan into which humans are being pushed by devils. On the left, people are falling into a fire headfirst while a devil stands by, holding a birch. 4. Frescoes on the apse and south presbytery wall. The right presbytery wall is dedicated to the rewards of the Just. 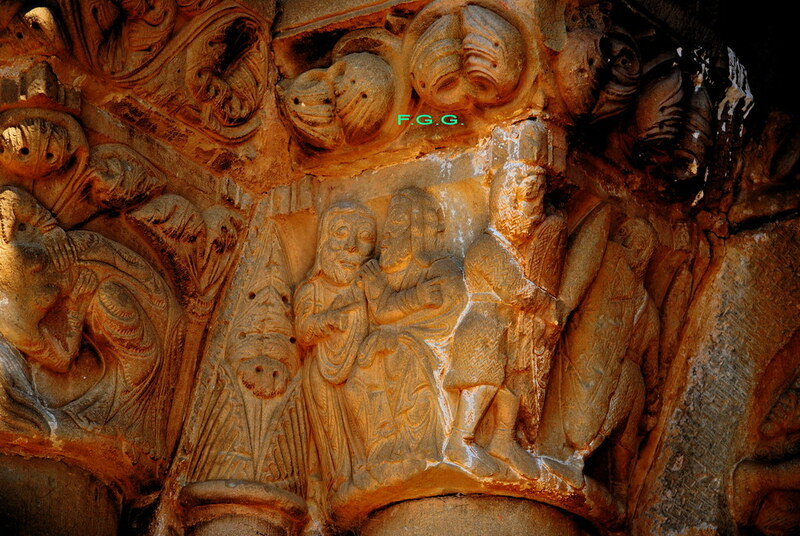 In the top register, couples holding children are bringing them to a seated person (damaged) on the right. In the lower register, Abraham sits on the left holding a cloth between his hands – seated in this manner, he represents Paradise. Walking towards him are men holding souls and one holding a long-handled cross. Vamos a centrarnos primero en el atuendo de los contendientes. Ambos portan igual vestimenta y empuñan mazas o bastones. No son espadas. En la mocheta inmediata, en la que aparece el creyente regurgitado por el monstruo –al decir de los estudiosos- empuña por un lado una maza, bien definida, y por el otro, una espada. El maestro sabe diferenciar esos instrumentos y nosotros deberíamos hacerlo también. Recordemos cómo se esculpe a sí mismo –dicen- en Biota, allí con un hacha de cantero y ya muy anciano. Se despide. Capiteles de Santiago de Agüero y mocheta a la izquierda del espectador según se entra. 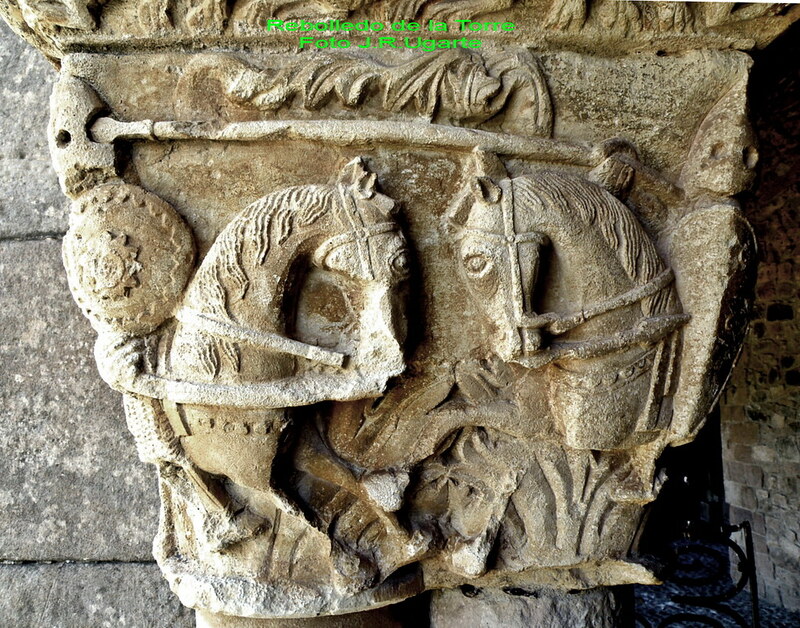 Pero no debemos abandonar esta portada de Santiago para encontrar más ejemplos de espadas: en el capitel doble que cierra el conjunto a nuestra derecha, aparece un centauro sagitario vuelto hacia atrás –referencia al musulmán y por extensión al mal, según nos explican – al que combate un soldado -el bien, o sea el cristiano- que empuña una neta espada. Si se quieren más ejemplos que despejen dudas de la habilidad del tallista para poner lo que nos cuesta tanto entender hoy, no hay más que hacer una excursión hasta Biota, aprovechando la visita al viejo tallista de su mocheta. Bien; una vez establecido que son bastones y no espadas lo que manejan nuestros dos luchadores, podríamos ir planteándonos que, conforme a los fueros aragoneses, ésta pudiera ser una iglesia juradera, más si se tratara de una “nueva San Juan de la Peña” y por tanto estaríamos ante un combate judicial. Los árbitros aparecen en el lado exterior de nuestro capitel, gesticulando. Pero hay otro argumento poderoso utilizado para aludir a la lucha contra el infiel: las marcas de los escudos. Ahora tenemos que meter la lupa en nuestras fotos y encontraremos una sobreabundancia de medias lunas que ni son cuartos crecientes ni menguantes, que bien pudieran –como las del rival- haber sido víctimas de vandalismo: alguien pudo venir a posteriori a hacer incisiones en los escudos para “aclarar” el tema. Ocurre que el rival del "musulmán", en contra de lo que se dice, no tiene inscrita en su escudo cruz alguna (la lucha de la cruz contra la media luna no se ponía en los capiteles de entonces) sino que está plagado de estrellas de seis u ocho puntas, Ahora más liviano porque es más difícil de hacer que la media luna. Hasta por el borde del escudo. Si tenemos en cuenta que justo en el interior de la puerta se esculpen dos escenas de lucha y persecución de cristianos y musulmanes, ninguno de ellos tiene –como luego veremos- marca alguna para diferenciarlos o identificarlos, cosa que sería más sencilla en el interior. Y para señalar sin manipular, hemos marcado las estrellas, que se reparten por toda la superficie del escudo, incluso el borde. Las medias lunas del otro escudo se ven sin duda. 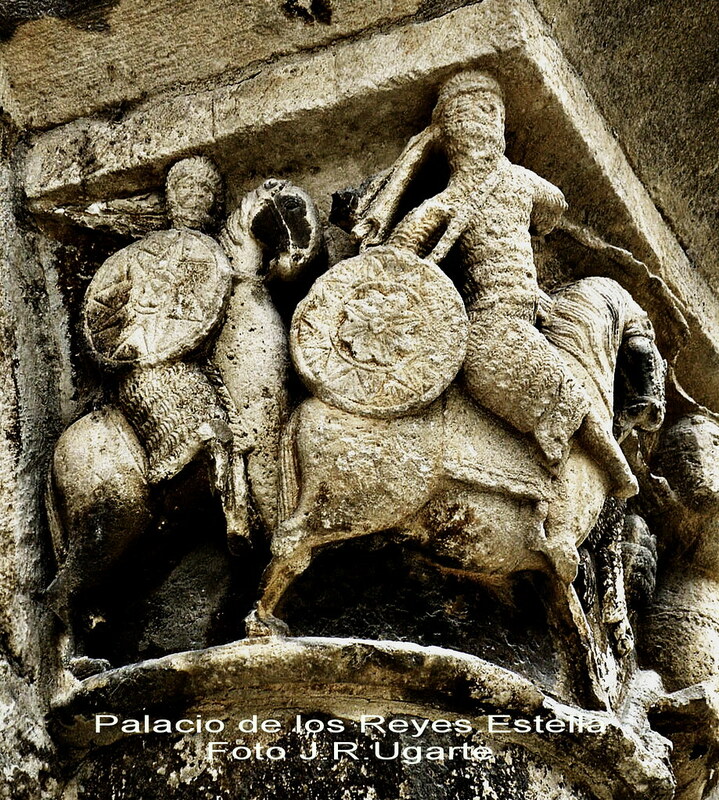 En el famoso capitel del palacio real de Estella con la lucha de Roldán y Ferragut, aparecen dos caballeros musulmanes, al menos sus rodelas así lo aparentan, y ahora sí, encontramos una estrella de seis puntas, pero en el centro del escudo y una única, no sembradas a voleo como en Santiago. También esa especie de flor de ocho pétalos que luce el otro guerrero en el escudo, es distintivo de las tropas musulmanas, como se puede ver en el pendón de las Navas de Tolosa, donde no aparece nada de media lunas. En los casos que hemos estudiado al principio de este foro de los combates a escudo y bastón en el norte de Palencia y de Burgos, ninguno tiene distintivo y menos de musulmán contra cristiano. En la portada de Escalada, tan silense, tan dañada, que también contiene elementos comunes con Santiago, aparece el combate a escudo y bastón, pese a que éste aparenta más un hacha (pudiera ser de madera) y además se acompaña de otro tema de Santiago: los leones o monstruos devorando un cuadrúpedo. Mismo modelo y formato, no hay más que ver los morros de los leones.Y es que pensamos que en un tiempo tan tardío para el románico, hay ya talleres organizados, maestros reclamados desde otros reinos y se produce un mayor intercambio de modelos y de tallistas entre los reinos de Aragón y Castilla, por un “puente” natural como es La Rioja (Santo Domingo de la Calzada) Navarra (Larranoa) y Alava (Treviño, etc). El infante desnudo que aparece esculpido entre aves en el interior tiene relación con Santiago de Compostela, lo que sugiere un intercambio frecuente. Aparte de las posibilidades que hemos citado, hay otra también razonable: estos luchadores están dirimiendo una disputa, un juicio por motivos territoriales. Serían uno representante de los Luna, familia poderosa en todo el territorio (Luna está a unos 40 kms.de Agüero) que edificó su propia y valiosa iglesia y en cuyo escudo pudieran mostrarse esas abundantes medias lunas, que ni son menguantes ni crecientes, por eso no le damos valor. Si vemos el pendón de las Navas, logrado pocos años más tarde, no vemos ni asomo de medias lunas, y sin embargo, su centro está ocupado por una vistosa estrella de ocho puntas, que recuerda mucho al escudo de Estella y nada al de la portada de Santiago, no así al del interior. De todos modos, si estamos ante una disputa legal o una batalla judicial, falta ver el motivo. La disputa territorial que citábamos lo hacíamos en base a la posible intervención de los Luna. Luego comentaremos los estudios –que ya citamos al principio del blog- sobre los fueros aragoneses, y especialmente al de Jaca, estudiado por el profesor Buesa (padre). En la cara externa del capitel, hay otra prueba más de que no es un combate guerrero. Dos hombres gesticulan amigablemente y parecen apuntar y discutir sobre el resultado o el motivo de la pelea al otro lado. Atención al gesto del sentado, recogiendo su toga con la mano.Eso sí lo hemos visto y estudiado cuando vimos las ordalías, sólo que aquí no hay juramento, nadie mete la mano en la boca del león, ni parece sufrir la prueba caldaria, tan habitual en Aragón, según cuentan los historiadores. Pero es que estamos a finales del siglo XII y la Iglesia no quiere favorecer las ordalías, pero la fuerza del pueblo, de las costumbres, y la falta de una organización judicial adecuada, obliga a que los temas de honor se resuelvan “como antes”. Pero ahora nos interesa resaltar el motivo real que puede haber desencadenado esa batalla judicial: lo tenemos arriba, levantando la vista hacia los seis canecillos, de otra mano menos vistosa que el maestro, pero seguramente, miembro también del equipo. La curiosa iglesia románica, precipitadamente terminada, de Santiago de Agüero ha atraído la mirada y supuesto un desafío para muchos estudiosos. Desde Iñiguez Almech a Inés Monteira, pasando por Daniel Zabala y terminando en la tesis doctoral de José Luis García Lloret sobre el maestro de San Juan de la Peña, la web de Omedes y la ficha de la Enciclopedia del Románico, muy próxima a publicarse. En todos, sin excepción, se señala la vinculación de parte de su escultura con la catedral de Santo Domingo de la Calzada, pero con muchas evidencias también del maestro de San Juan de la Peña, como el tímpano y los capiteles de la portada. La grandiosa foto de Omedes ya indica lo excepcional del enclave elegido para levantar la iglesia, que pudiera haber alcanzado el doble de lo que vemos. La idea general es que los elementos que conforman la portada actual no fueron concebidos para el lugar que ocupan y que es el resultado de la prisa y urgencia para terminarla. Para este modesto observador, una prueba del proyecto frustrado y edificio abandonado (en el sentido de no acabar cumpliendo la importante misión que se le pudo asignar, a la vista de las dimensiones de su trazado original) es el acomodo de un elemento apotropaico para proteger el edificio ante tanta soledad y el acoso de diablos, colocando en lo más alto de la cubierta un solitario y rudimentario canecillo con la imagen de un diablo : el efecto espejo atribuía la capacidad de asustar al diablo con su propia imagen en la cumbre de la iglesia. Es también sentido general de los estudiosos encontrar en la portada un significado de lucha del bien contra el mal, también personificado en las figuras esculpidas, apuntando a la lucha contra los musulmanes, el mal encarnado en el enemigo. Sin pretender desmontar las muchas y documentadas páginas escritas sobre esta iconografía, aspiramos a esbozar y razonar una posibilidad diferente, que tenga su enganche en otras esculturas castellanas y aragonesas, teniendo en cuenta lo tardío de su construcción –finales del siglo XII- y, una vez más, las leyes y costumbres que regían la vida de aquellos a quienes estaba destinado su uso, que en muchos casos participaban en la obra como peones y que necesitaban ver como propio y adecuado el contenido de su iconografía, porque si no, simplemente no acudirían al templo. Es nuestra modesta intención proponer que la lucha de villanos con cota de malla y bastón (primer capitel por la derecha) no sea lucha cruenta, sino parte de la resolución de un litigio como habíamos visto en el estudio de las ordalías referido al entorno de los fueros de Aragón : Jaca y San Juan de la Peña. Asimismo, los dos capiteles con bailarina que le suceden, no tienen por qué aludir a pecados ni a enemigos musulmanes, sino a fiestas y quizás una ceremonia fúnebre que se celebrara en la portada de las iglesias. También pensamos que es posible encontrar nuevos datos respecto a los capiteles interiores. Luego lo desarrollaremos. Iñiguez Almech, en su interesante libro “Sobre tallas románicas del siglo XII”, de 1968, estudia varias iglesias con vínculos entre sí y se detiene en Santiago, puesto que antes lo ha hecho con Santo Domingo de la Calzada. Lo tenemos en internet. De nuevo bella fotografía de Omedes, a quien intentaremos no "robar" más, puesto que tenemos una amplia colección, pero siempre sin sacar el conjunto. Nos gustaría que estuviera Cova para reñirnos una vez más por ese defecto. 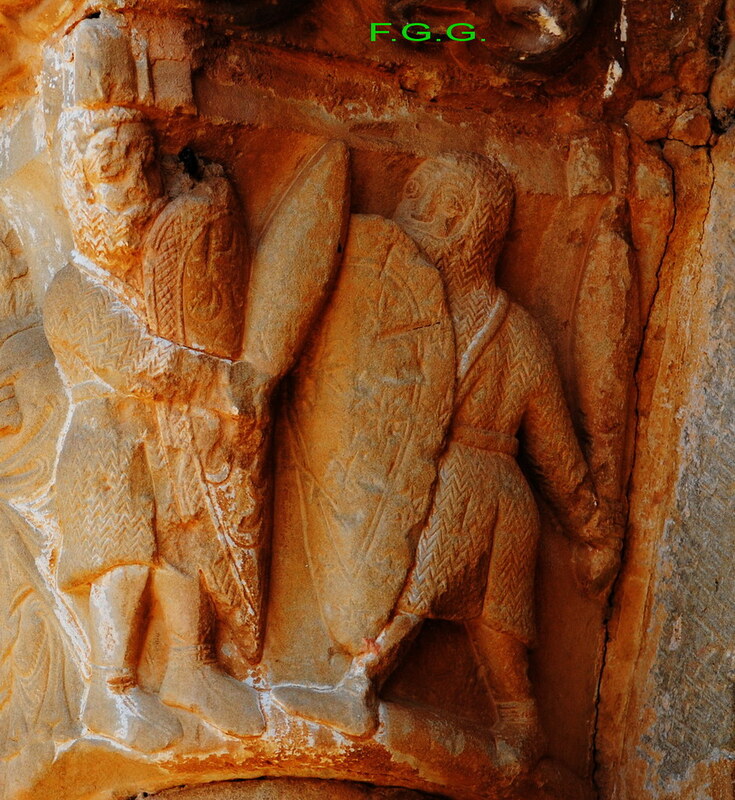 De los capiteles que nos interesa dice : “dos guerreros vestidos de mallas, sin casco y con altas botas de cuero, riñen singular batalla utilizando anchos espadones y escudos almendrados; el del rincón parece llevar una cruz y orla estrellada por divisa; el del ángulo, fondo sembrado de medias lunas y ajedrezada orla; dos barbudos en hábito civil comentan y señalan con los índices…”compara con la lucha ecuestre del interior, y sugiere una representación de la ira. Curiosamente cita como referencia a San Isidoro de León, pero no el capitel que nosotros vamos a proponer por su posible equiparación a esta escena, sino al del diablo que carga la ballesta, de origen francés y que identifica con la ira. 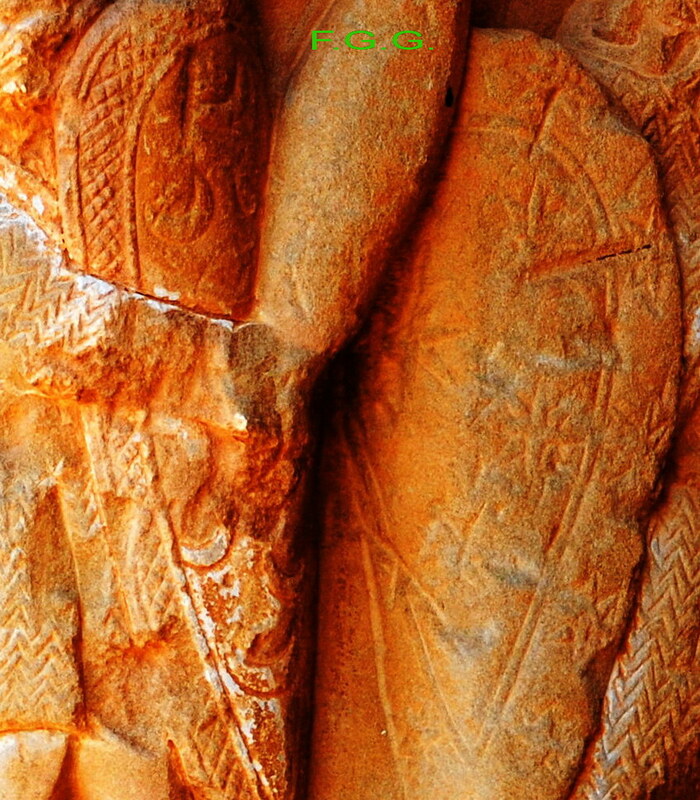 Como los capiteles adjuntos representan dos momentos de las bailarinas, hace un link entre ambas imágenes, concluyendo que se efigian dos pecados: la ira y la lujuria, ésta representada por la contorsionada bailarina identificada como Salomé sin razón evidente alguna y así ha conservado el sobrenombre. Casualmente la Salomé más conocida, la del museo de los Agustinos de Toulouse, ya ha terminado de bailar. A este fuego añadirá más leña posteriormente Inés Monteira señalando los vestidos y gestos moriscos de las danzantes y músicos adjuntos, con lo que la condena ya está garantizada. Como la serie culmina en ese lado con los dos leones devorando un cabritillo, propone la ferocidad o nuevamente la ira para justificar el ciclo. No digamos si añadimos al centauro sagitario del otro lado. Una de las propuestas que nos parece más atinada en torno a este templo que iba para gran edificio, se refiere a que pudiera haber sido concebido como nueva ubicación de San Juan de la Peña una vez innecesario su “escondido” emplazamiento tras la conquista de los territorios del llano. Así lo sugiere García Lloret en nota a pie de la página 255 de su tesis. Precisamente la condición de iglesia juradera que atribuimos desde su inicio al monasterio pinatense –recordemos la presencia de Daniel en la iglesia vieja, de la que tan sólo se conserva a Habacuc, y el propio Fuero- nos va a servir de punto de apoyo para considerar que la iconografía de Santiago tenía la misma finalidad. Aún a finales del XII se realizaban juicios y desafíos frente a las portadas de las iglesia, pese a que estaban rechazadas oficialmente por el clero. Cara interna con la lucha de dos guerreros, quizás villanos en una disputa resuelta a escudo y bastón. No hay duda de que se trata de bastones y no espadas, ya que en el capitel extremo izquierdo un soldado que lucha contra un ave tiene una espada bien definida y en la mocheta al lado de estos dos luchadores el humano lleva bastón y espada, bien diferentes. Este autor, al analizar el capitel que estamos tratando, y observar que junto al combate de soldados (para nosotros, villanos o en el contexto aragonés, mezquinos) se efigia una conversación con gestos entre dos hombres, deduce que es la antítesis entre la guerra y la paz, en este caso, con dos filósofos conversando. Luego lo veremos. 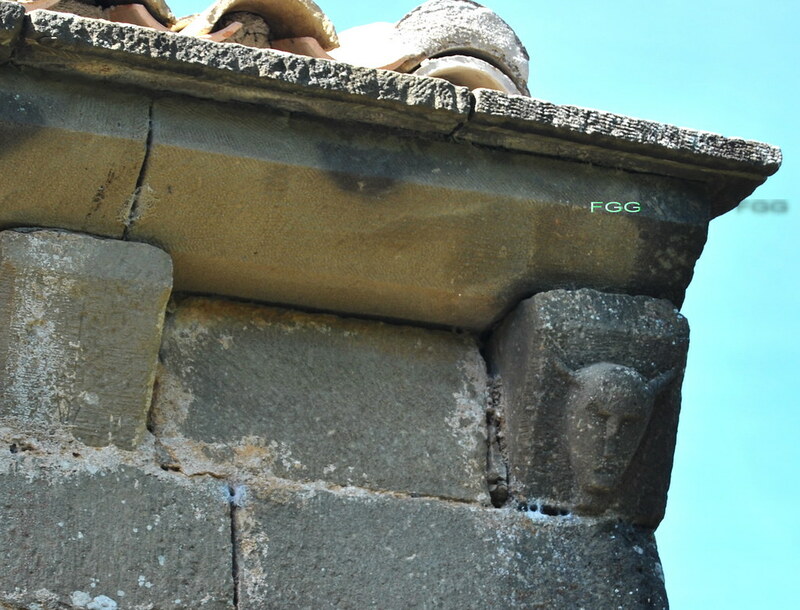 Como todos los investigadores que se han ocupado de este capitel, encuentran sencilla la identificación de los combatientes: uno de ellos tiene el escudo (cuyo formato es idéntico) plagado de pequeñas medias lunas mientras que en el otro han observado que tiene una cruz grabada. Así, con la ayuda de esos “falsos amigos” tan frecuentes en el románico, dan por recibido el mensaje. Como nosotros hacemos aún hoy. Pero es preciso afinar las fotos y ver el contexto y ahí podemos hacer una nueva propuesta, que enlaza con muchas de las iglesias románicas de esa época, tal como hemos visto al principio de lo expuesto en este blog. Estudiamos el último y aparatoso elemento identificable de la portada de Alne: la ballena. No lo parece, puesto que lo que muestra es un barquito a vela tripulado por dos hombres y las letras reconocibles por Druce eran : A PI O, que corresponden a ASPIDO, ya que el animal que protagoniza la escena, con una bella elipsis que tanto nos gusta del románico, es la ballena, el ASPIDOQUELONIUS o aspido testudo. (aspido:escudo;quelonio: tortuga). La Biblia hace a la ballena protagonista de la azarosa salvación de Jonás, clara representación de la resurrección de Cristo. Además de sus características adecuadas para ocupar un lugar en el bestiario, terminaremos con una mención a una de las más imaginativas proezas medievales: el viaje de San Bandrán. En el bestiario se potencia el tamaño del cetáceo de modo que lo hacen confundir a los marineros con una isla, que es lo que muestra el medallón de Alne. También era llamado fasticalon. Lo veían con una piel de color tierra, lo que ayudaba a confundirlo con una isla. Cuando los barcos navegaban por mares exóticos, divisaban una isla en la que desembarcaban y hallaban plantas y árboles. Luego encendían un fuego para cocinar y calentarse y como se trataba de la joroba de una ballena, ésta al sentir el calor, se sumergía y arrastraba barcos y tripulantes al fondo del mar. Se consideraba a la ballena o aspidoquelonius capaz de abrir su gran boca y dejar entrar en ella a multitud de peces pequeños, que luego tragaba. Los peces grandes ya conocían ese peligro y lo evitaban. Así lo describe en su estudio sobre el bestiario Malaxecheverría, añadiendo que en su aliento despide un atractivo olor, cosa que algún estudioso sólo puede explicar por la proximidad de su descripción en el bestiario a la figura de la pantera, que ya hemos estudiado. La enseñanza moral no puede ser otra que evitar las tentaciones: Así tienta el demonio y los herejes con sus palabras agradables y la seducción de su aroma, a los simples que carecen de juicio…Job fue un pez adulto, lo mismo que Moisés, Jeremías, Isaías y todos los profetas. Igualmente tuvo fuerzas Judit para escapar a Holofernes, Ester a Artajerjes, Susana a los ancianos y Tecla a Tamiris. 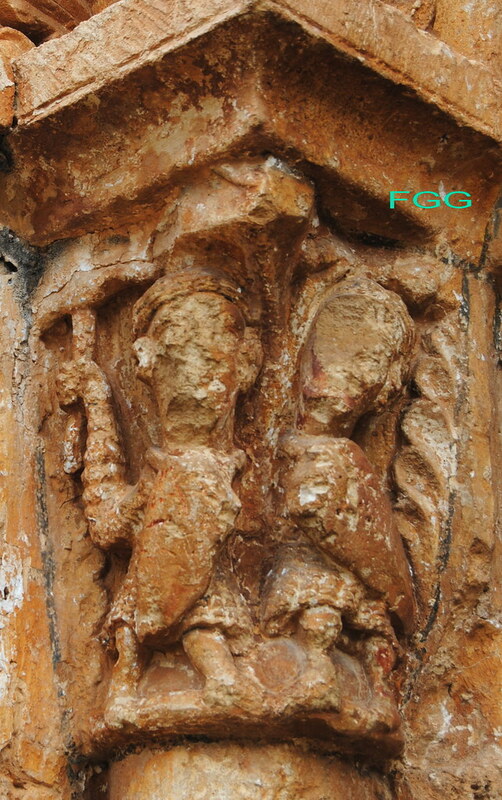 (Santa Tecla era santa discípula y compañera de San Pablo y un modelo de castidad femenina). Otro nombre, probablemente latino, lo denomina Cetus, que ya señala mejor al cetáceo como lo conocemos. “El cetus es el demonio, la mar es este mundo y las arenas son las riquezas terrenas; el alma es el marinero y el cuerpo la nave que debe cuidar y el fuego es el amor con el que el hombre, como dueño, ama su oro y su plata. Cuando el demonio se da cuenta de esto, y más seguro se siente el hombre, entonces le ahoga”, termina la cita. En el texto de Evans que venimos usando “Animal symbolism in ecclesiastical architecture” se añade que se tardaban tres días en recorrer el animal de la cabeza a la cola y que una tradición árabe achacaba los terremotos al movimiento de la monumental fiera. En “la versión C del fisiólogo latino” del trabajo de Docampo,Martínez y Villar se dice ( MS 318 Berna f 15 y 16) : A este animal se asemejan las mujeres fornicadoras, de las que dice Salomón: Porque mana la miel de los labios de la meretriz, que unge tu rostro con ungüento; pero después resulta más amarga que la hiel, y más cortante que una espada de doble filo; ella hunde en las tinieblas al pecador. Pero no se acercan a ella los perfectos y los cautos, como lo fue José ante la mujer egipcia, como lo fue Elias rechazando a Jezabel,como lo fue Susana en medio de los viejos. Con razón, por tanto,es asimilada la mujer a este pez. De estos ejemplos citados por Salomón, quizás el menos conocido sea el del casto José, hijo de Jacob, famoso por sus sueños de vacas gordas y flacas, y de exitosa vida entre los faraones, a quien la mujer del eunuco general Putifar, tentó descaradamente hasta el punto de sujetarle por la túnica cuando quería salir huyendo de la peligrosa alcoba. En el subsiguiente juicio contra José por la falsa acusación de la Putifara de intento de violación, pudo acreditar que la túnica estaba rasgada por la espalda, lo que demuestra que el casto joven salía huyendo, y según la acusación de la fogosa dama -justificada por tener por marido a un eunuco- la túnica debería haber sido rota por delante si hubiera tenido lugar tal intento de violación. Así aparece en el capitel la dama tirándose de los pelos y con la túnica en el brazo mientras al pobre José le muelen a palos los criados de Putifar. Como es lógico, no se compara a la dama con una ballena, sino su comportamiento tentador. No parecía estar tan gorda. La razón de la inclusión de este medallón con la ballena “que no vemos” pero que es sobre la que aparecen los dos hombres en el barco de vela, se debe muy probablemente a la leyenda del viaje de San Brandán, original de los siglos V y VI y muy popular sobre todo entre los pueblos irlandeses y celtas hacia el siglo X, lo que provocaría su inclusión en este bestiario. En un gran trabajo de Dolores Corbella en la revista Filologia Románica de la Univ.Complutense de Madrid de 1991, titulado “El viaje de San Brandán, una aventura de iniciación” se analiza este viaje de iniciación del santo irlandés acompañado de otros catorce(2 x 7) monjes en busca del Paraiso Terrenal, repleto de peripecias y hechos asombrosos (el camino iniciático, atraídos por el finis terrae) a la manera de los viajes clásicos de Ulises, Hércules o luego el Dante y actualizados por los peregrinos a Santiago. El hecho de hacerlo a través del agua no deja de ser otra muestra del intento de purificación. También supone una alegoría la materia misma con que está construída su frágil nave: de madera de abeto y envuelta en tiras de piel de buey. En opinión de la investigadora, se propone quizás por primera la vez en la Edad Media la visión de un lugar que empieza a nacer: el purgatorio, como tercera opción del más allá. Además de asomarse al cielo, también conocen el infierno y tienen ocasión de contemplar a Judas en una visión impresionante. Pero lo que nos interesa en esta historia es lo relativo a la ballena sobre la que sufren la aventura que mencionamos, que se sumerja al sentir el calor del fuego que encienden, aunque sin desgracia que lamentar para los peregrinos. La estancia en esta extraña isla viviente (el pez-isla) la realizan para celebrar la Pascua, y en los consecutivos siete años del viaje acuden al evento anual, como si el lomo del cetáceo fuera su lugar de culto. Como se puede ver por el grabado de la wiki, la misa de Resurrección se celebra cada uno de los siete años, sobre el lomo de la ballena, varada al norte de las Islas Afortunadas, que corresponden a nuestras Canarias. Más al norte, la isla de San Brandán (castellanizada como san Borondón). Muchos de los seres fabulosos del imaginario medieval aparecen en el viaje, un poco a la manera como Baudolino realiza su viaje en busca de la tierra del Preste Juan en la magnífica novela de Umberto Eco, en la que tan sólo la trama es ficción puesto que todos los animales que aparecen han sido tomados de los bestiarios. Quiero decir que Eco ha sido fiel a las descripciones de los bestiarios, lo que no significa que fueran animales reales. El relato traducido del viaje, cuyo original es desconocido, lo hacen en la revista Cristiandad.org. No falta la reiterativa búsqueda del Grial, la visión del árbol Peridexion, en el que los pájaros explican que son ángeles, combates entre grifos y dragones, y, como hemos señalado, los terribles lamentos de Judas por los padecimientos que sufre cada día de la semana. Termina así: “como va alboreando el día, a Judas se le llevan todos los diablos”. En un magistral artículo del doctor Prado-Vilar titulado “Nostos: Ulises, Compostela y la ineluctable modalidad de lo visible”, cita los diversos personajes clásicos cuyos viajes míticos han servido de referencia para la búsqueda de paraísos o perfecciones del cristiano. Así, menciona el hecho de que Dante, a la manera del Judas de San Brandán, sitúa a Ulises en el infierno, queriendo explicar a cada visitante cómo se cerró el mar sobre él y sus hombres cerca de las columnas de Hércules, quizás por querer perpetuarse como peregrino una vez alcanzado su destino original. Como si se condenara el caminar por caminar o el anhelo de querer conocer más de lo que el Creador tiene decidido, que señala el autor. Dejando aparte ese inusitado final del héroe griego, su figura tan popular en la Edad Media era ejemplo positivo en las representaciones románicas por su resistencia a las tentaciones y su fortaleza de espíritu. 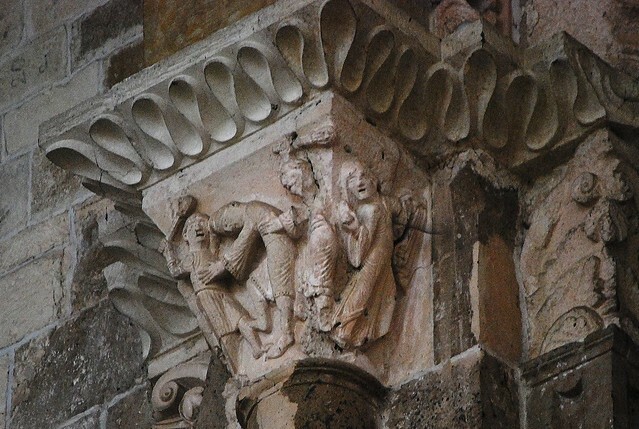 Eso es lo que encuentra el profesor en las columnas entorchadas de la puerta francígena de Santiago, que analiza minuciosamente en el artículo. Hay en los monstruos de la columna uno llamado Escila, de torso femenino pero muy dañina por provocar los naufragios y que suele aparecer en compañía de sirenas. A estas infernales figuras se resiste un “Ulises cristomimético” como lo describe Prado-Vilar y uno siente cierta tentación de equiparar la Escila con el Espido, que de ser posible, equipararía la acción de los monstruos-tentaciones con los de San Brandán, ahora viajero en manos de Dios en busca del Paraíso terrenal. Finalmente, es recomendable la lectura de otro trabajo literario sobre el viaje, elaborado por Regina Valdés de la Universidad católica de Chile, accesible en internet.